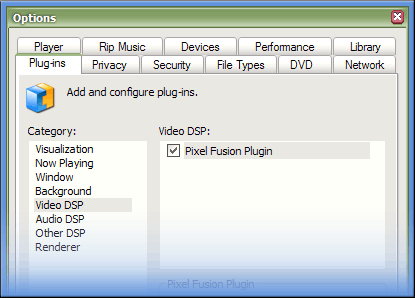 Pixelfusion is a new technology that enhances digital video, and has taken over 5 years to develop to its current standard. From the start, it was designed so that it could be implemented in software and run in realtime on a home PC, but we also made sure that quality was a high priority. Pixelfusion is different, in that it attempts to more accurately predict the pixels that existed in the original high resolution source, to create more image..
Pixelfusion is a new technology that enhances digital video. ...... When viewed, it is usually stretched, or resampled, to a higher resolution. This process is what causes the video to become blurry. Video could be viewed at the original resolution, but it tends to be very small, making it difficult to watch. The key is in the algorithm which enlarges the video to a reasonable viewing size. Usually, a standard bilinear or bicubic algorithm is performed, which work by interpolating the existing pixels in an image to create more pixels. Because they only perform a simple mathematical interpolation which reproduces smooth transitions from one pixel to another, they will always cause an image to appear more blurry. Pixelfusion is different, in that it attempts to more accurately predict the pixels that existed in the original high resolution source, to create a much crisper and perceptually clearer image. Qweas is providing links to Pixelfusion 1.6 as a courtesy, and makes no representations regarding Pixelfusion or any other applications or any information related thereto. Any questions, complaints or claims regarding this application Pixelfusion 1.6 must be directed to the appropriate software vendor. You may click the publisher link of Pixelfusion on the top of this page to get more details about the vendor.